The Italians have their pasta, the Japanese have their sushi, and we Aussies have our pies. But we've come far from the good old meat pie, and expanded our filling horizons to include a variety of flavours. Flaky pastry, and a tasty filling are must-haves for the perfect pie; so where's the best place to find them in Sydney? I can't go past Bourke Street Bakery, all their pies are deliciously gourmet and prepared daily. I agree with Soph, Bourke Street Bakery for sure. I also like some of the pies at Thomas Dux Surry Hills. They're not gourmet or anything but I never go wrong with Pie Face! Very yummy selection of pies. There's a couple in the city, one right near Hyde Park and you'll also find a shop in lots of shopping malls. If you're looking for sweet pies, you can't go past the pies at Jazz City Milk Bar - they are utterly insane! Also The Pie Tin in Newtown are great for their sweet and savoury pies too. 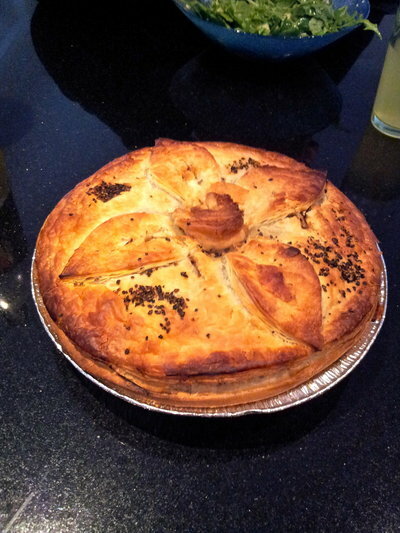 For fantastic traditional pies (flaky pastry, properly done, served piping hot and fresh), as well as a real gourmet selection with everything from Mexican to Chicken curry flavour, and a vegan menu plus a bunch of sweet treats go to Janet's Pies in Newtown. They really can't be beaten in my opinion, and can be made into a great meal with sides like peas and mashed potato. If I'm not in that area Pie Face would be the other one I can recommend highly - and the faces they make in the pastry on top are just TOO cute! It's fun just to have a look at them when you walk past. Can't go past Glenorie Bakery and its sister shop in Windsor NSW. Best are the curry pies. This is THE Best Place for a Pie!